I found the following story to be of interest; not sure if you are aware of it. The upshot is that it’s ‘legal’ under the Mexican Constitution for people to form militias to police and protect themselves when the central or local government fails to do so. US support for the Mexican regime has created narco-capitalist anarchy in that country, in which elements of the state are either engaged in a criminal enterprise for the federal government (capitalist) or for the narcotics shadow organizations (narco). People who have found themselves at the mercy of either also discovered that the formal bourgeois laws mean almost nothing at all in terms of personal safety or protection, and in some areas have attempted to form militias. The attached story concerns a woman who was part of a people’s militia in rural Mexico, who was so successful at mobilizing the people to restore order, she was of course arrested by the ‘legitimate’ police at the behest of the criminal elements who dominate the area. In any case, I think the implications are interesting for revolutionaries—the only drawback in the Salgado case was that the militia was not quite massive enough to actually nullify capitalist power in the area. In time they may be. To start, we refer our readers to the articles from our Mexican section on pages 6 and 7: “Mexico: Community Police and the War on Drugs” and “IG: For ‘Independent’ Vigilantism.” The case Todd B. mentions, that of Nestora Salgado, exemplifies the nature of such community police forces, which do not pose a threat to capitalist rule, but act as auxiliaries to the bourgeois state. As a U.S. citizen of Mexican origin, Salgado returned to Mexico and took it upon herself to restore “law and order” in the face of drug cartel violence and official corruption in Guerrero, and was elected commander of the community police in the town of Olinalá. 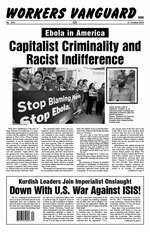 The second link that Todd B. provides is to an article by the Freedom Socialist Party (FSP), which joins much of the reformist left in tailing these vigilante forces. While approvingly referring to a letter from Salgado’s lawyer stating that she was “armed and trained with the help of the governor of her state,” the FSP nevertheless hails her for personifying “the international solidarity and bravery” critical to survival of “the poor and working classes…throughout our hemisphere.” No doubt in the eyes of the “socialist feminists” of the FSP, the fact that Salgado is a woman of indigenous origin is sufficient cause for them to tout her as a proletarian internationalist. But, as an adjunct to the capitalist state, Nestora Salgado is no class-war prisoner.